A few months ago, I mentioned a brand called Mary's Gone Crackers. 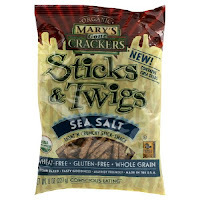 They produce a line of gluten free crackers along with a tasty gluten free snack known as Sticks & Twigs. At that point, I had tried their crackers that are made with organic brown rice, organic quinoa, organic flax seeds, and organic sesame seeds many times. I had never tried the Sticks & Twigs. Well, when I was at the Fancy Food Show in NYC I was able to grab a free sample of the sea salt flavor. Then, I was lucky enough to receive a box of samples from Mary's Gone Crackers with a bag of their Chipotle Tomato Sticks & Twigs too. Sticks & Twigs look exactly like that but they make for a great, healthy, crunchy snack! For example, last night I brought a bag with me to Central Park to watch the Philharmonic and they were the perfect addition to our tasty assortment of snacks. For more information, please visit www.marysgonecrackers.com. To purchase products from Mary's Gone Crackers, visit your local health food store. You may also purchase them at Ms. Celiac's Market!